Last night Locarn O'Neill's gallery presented Pietro Ruffo solo exhibition at Studio Curtis in Piazza Venezia in Rome. PIETRO RUFFO (b. 1978 in Rome) has made a body of new work which explores the theme of human migrations throughout history. 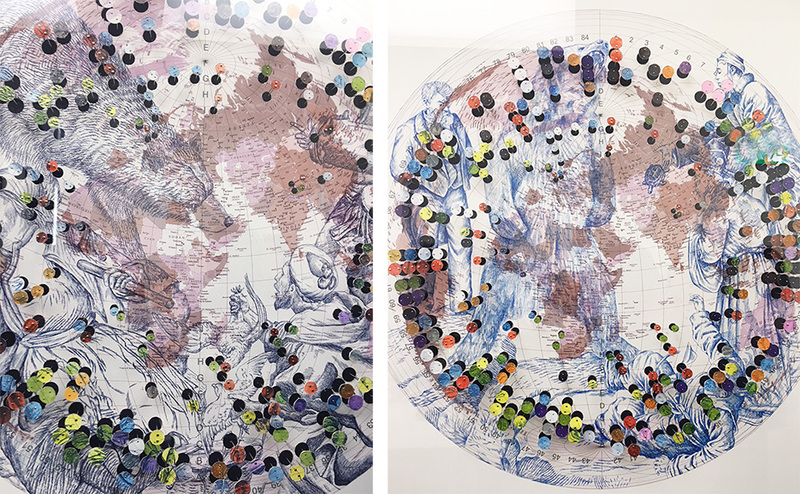 He looks at the political and environmental realities that cause these movements of populations, as well as the philosophical and moral justifications used to condone or condemn them. These new works are exhibited in the historical setting of Piazza Venezia, where over two thousand years of history converge, in a building with a view that embraces the Altare della Patria, the most symbolic monument of Italian national identity; the Palazzo Venezia, where Mussolini had his office in the Sala del Mappamondo (the room of the Globe) and the balcony from where he delivered his most infamous speeches; as well as Trajan’s Column, the Roman Forums and the long Imperial view that leads to the Colosseum.